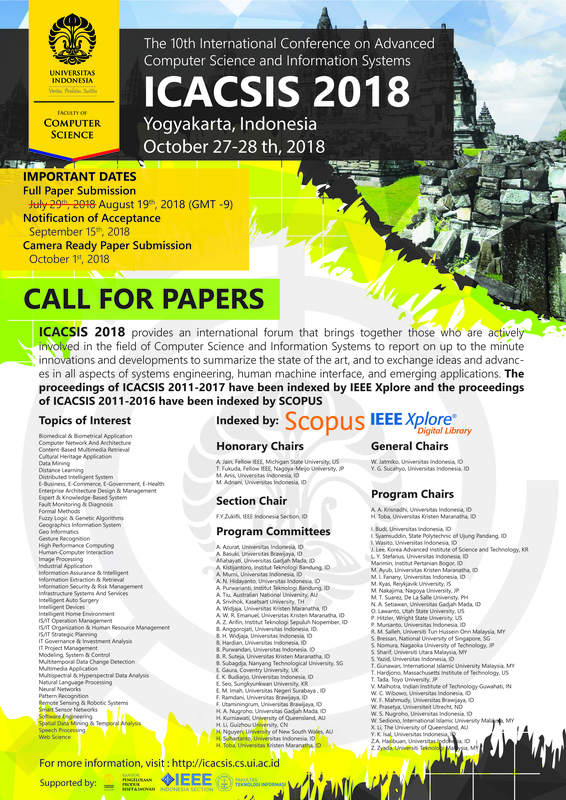 The 2018 International Conference on Advanced Computer Science and Information Systems (ICACSIS) provides an international forum that brings together those who are actively involved in the field of Computer Science and Information System to report on up-to-the-minute innovations and developments, to summarize the state-of-the-art, and to exchange ideas and advances in all aspects of systems engineering, human machine interface, and emerging applications. The IEEE has implemented policies to exclude authors who do not present their paper from further distribution of their publication, such as exclusion from IEEE Xplore. Such papers will be archived at IEEE but will not be indexed or appear in IEEE Xplore.